The laid-back atmosphere of the Cherry Grove section of North Myrtle Beach is where you will find the beautifully designed condominium residences of Springs Tower. 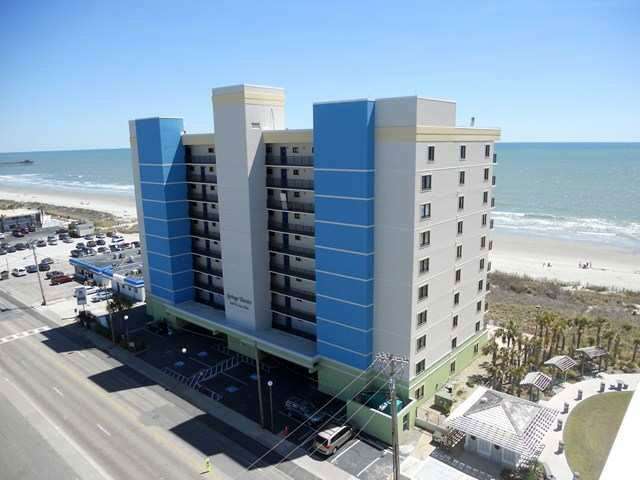 This oceanfront retreat features ten floors of three-bedroom condominium residences, all of which enjoy private, oceanfront balconies from which you can enjoy sweeping views of the pristine, white sand beaches of the Grand Strand. Read more about Springs Tower real estate. The quiet Cherry Grove section of North Myrtle Beach, along North Ocean Boulevard, enjoys a secluded, quiet location, and is home to the historic Cherry Grove Pier. Fishing, boating and kayaking, as well as a variety of other outdoor sports, can be enjoyed in this area of North Myrtle Beach, as the beautiful, salt water marshes wind their way throughout the community. All condominium residences of Springs Tower include three bedrooms, two full bathrooms, and plenty of room to comfortably accommodate up to eight people. Each suite boasts a gorgeous, oceanfront location, a fully equipped kitchen, a washer and dryer, a wet bar, an expansive, private balcony, a master bedroom with private access to the balcony and a master bathroom with a Jacuzzi tub. An expansive, oceanfront sundeck provides the perfect spot at which to gaze at the wind-swept sand dunes and the rolling surf, while an oceanfront swimming pool and Jacuzzi tub offer up plenty of opportunities to play with the kids, relax with friends, or lounge in the shade of a beach umbrella. An oceanfront lawn, sundeck and grill area provide yet more outdoor space at which to picnic, play or simply lay back and relax. Plenty of outdoor space makes Spring Towers stand out from many of the other resorts in Myrtle Beach.